This astrolabe is particularly finely crafted and highly accurate. It is made up of the mater and just one plate for a latitude of 45 to 48? (corresponding to a range of locations from the Paduan plain to Bavaria). 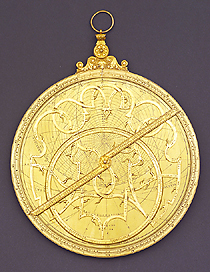 The back of the astrolabe displays a shadow square and hour lines, as well as the signature of the maker, Christoph Schissler, the place of construction and the date. The instrument was part of the endowment that Prince Mattias de' Medici brought from Germany in 1635 to enlarge and enrich the Grand Ducal collection.